Curious about the incredible social media statistics which it is capable of? Social media has grown from being seen as a fad by many people, to something that has completely turned upside down on the marketing world and the way we view human communication and interaction. Both for marketers and for regular users. In just a few years, social media has gone from being something for the kids to now being something that is used by a large part of the world’s inhabitants. The social media statistics in this article shows not only the immense growth of social media and how quickly it has grown and evolved, it also shows how people are using it, and maybe most importantly, the social media statistics also show just how powerful it is in marketing. And when you see those statistics, it’s not that strange that more brands than ever are leveraging social media for marketing. In this article, we’ve compiled the most significant social media statistics out there, that cover all areas of social media, so we can get an idea of how social media is impacting the world – in many different ways. Let’s dig into these social media statistics, because this is about to get interesting! That’s a ton of people! As a brand, even if you’re only reaching a tiny fraction of that number, you have the potential of getting quite the exposure on social media. This shows the importance of mobile and the role it plays in people’s lives. Make sure your social media bios are optimized for mobile and that your profiles look appealing on mobiles, but also desktops. It’s also important that you’ve optimized your website for mobile if you are going to drive people from social media to your site. If your website isn’t optimized for mobile, your bounce rate will dramatically increase. Especially if you’re driving plenty of traffic from social media because almost all users access social media on a mobile device. 10% of internet’s users use social media. Up 10%, or 354 million since January 2016. This number is growing at the speed of light and it t isn’t slowing down anytime soon. If you aren’t using social media to meet your customers, you’re missing out on tremendous opportunities. The average internet user has 5.54 social media accounts. This shows that it’s not enough to only use one social media platform as a brand. Your customers are using more than one, and so should you! The Instagram feature “Stories” is increasing has increased in popularity since its launch, and it is continuing to do so. Instagram Stories allows you to share posts on Snapchat that are up for 24 hours and then vanishes, and this is a fun and engaging way to share content on Instagram that is more “raw”, and “behind the scenes”, and in that way engage your audience. 77 percent of people have a social media account in the U.K. If you’re targeting customers in the U.K., chances are you’ll be able to find your target audience on social media with ease. The key to the world is in your hand. Your mobile device is becoming more and more important in today’s society, and today, it is literally the door to the whole world. Not only is it the key to all the world’s knowledge, it is also with that you can interact with people from all over the world in a matter of seconds. And you can do that by using social media. As a marketer, this is worth thinking about, as you need to optimize your content to fit into a mobile format. 1 million new active mobile social media users are added every day. Or, 12 each second. The social media revolution has begun. Make sure you are on top of the latest things in social media because it’s an incredibly quickly developing world. Social Media users have increased by 176 Million in the last year. At the same time, 365 Million active mobile social users have been added over the same time period. As more users are added to social media, it is getting more difficult to cut through the noise. Make sure you have a strong social strategy that makes you stand out from the millions of users that are added each day. For you as a brand, this is good news, because it means that you now have the ability to reach a huge part of your target audience and that more brands than ever can reach their target audience on social media. Believe it or not, but the way we consume news is changing, too. Because today, 67% of Americans get their news from social media. This is a statistic that proves that social media is completely disrupting the news market. And either you can be romantic about how it used to be and complain, or, you can embrace what is happening, and realize the immense potential that lies within this shift of the way people consume news. That means that 217 million people are turning to social platforms to keep up with current events. Why not let your business’s messages be a part of that daily traffic too? Close to 80% of time spent on social media platforms happens on mobile. Most of the people who interact with you on social media are using a mobile device so make sure the content you put out is optimized for it. Over 56% of online adults use more than one social media platform. If you are a person who says that social media is just for teens, you’re terribly wrong. Whether you’re a business who is targeting teens or adults, chances are your target audience to be found there. Again, more than half of the adults using social media have more than just one social platform they’re using, so make sure you identify which those platforms are and how you can reach your audience by using them. 10 years ago, 7% of the US population used one or more social networking sites. Today, that number is 65%. 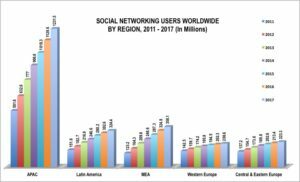 Quite a powerful social media statistics that show in which direction social media is going in our society, and how it is growing to have an important role in our lives. The average American spends an average of 37 minutes a day on social networking. There’s a ton of content being put out on social media every second. To be able to get the attention from people, and to steal a bit of that time, you need to have a powerful content strategy that grasps their attention and keeps them glued to your social media page. Not surprisingly, this is a number that will continue to increase, as social media plays a bigger and bigger part of our everyday lives. That’s a huge number! 91% of retail brands wouldn’t use social media if it wasn’t effective for their marketing. This just goes to show how powerful it is, and how social media has become an important and natural part of a brand’s marketing efforts. In 2015, social networks earned an estimate of $8.3 billion from advertising. Brands’ social media ad spend is skyrocketing, and that number is increasing for every year. At the same time, traditional ad spend is decreasing. This switch doesn’t happen without a reason. With the help of highly targeted ads, only reaching the people who really matter, brands can get a far higher ROI, and at the same time be able to measure those results in a way that we thought was impossible 10 years ago. Social media has gone from being a luxury for just a few selected brands to something that is vital for almost all. If you aren’t using social media for your business, you are probably, and most likely missing out. 49% of social media users prefer to interact with brands via Twitter. Is your target audience among those? That’s almost half of social media users, so chances are: they are. But to be completely sure, take a look at the Twitter demographics so you aren’t wasting your efforts on a platform your target audience doesn’t use. 70% of marketers have used Facebook and successfully gained customers. There’s no need to speculate if Facebook works or not in terms of generating customers. Just look at the statistics! 70% of marketers have successfully gained customers from Facebook, and chances are: you can too! 66% of marketers say that social media is essential to their marketing strategy. Social media is an essential part of many brands’ social media marketing strategies, and just in recent years, more and more marketers have started to realize that maybe social media should be an essential part of their marketing strategies as well. Also, 66% of marketers don’t say that social media is an essential part of their marketing without a reason. They say that because social media marketing works, and there are tons of statistics to prove that. Just look at the following statistics. 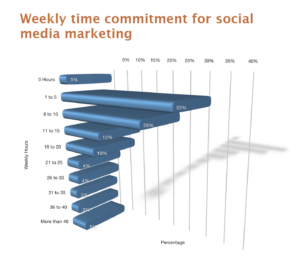 25% of marketers spend 6-10 hours per week on social media marketing. You can’t achieve social media results without investing time. If you want to achieve the results showed in the statistics here, you need to put in hard work. Whether you create a team or do it by yourself, time and a strong social marketing strategy are critical for success. 41% of marketers spend 11 hours or more, weekly on social media. The more time invested, the better results and 41% of marketers realize that. If you aren’t putting in 11 hours on more, weekly, on social media, you aren’t reaching the results you could be seeing. 38% of companies plan to spend more than 20% of their total advertising budgets on social media marketing in 2015. Up from 13% from the previous year. Proof that social media marketing works. And that it works better than the advertising channels they’ve used previously. Why else would we see a transition in the way brands are spending their marketing budgets? 59% of Americans that use social media think that customer service through social media has made it easier to get their problems solved. Social media is not just an effective tool to increase brand awareness and reach new audiences. Social media is also an amazing tool for managing the customers you already have, and make sure your retention rate is high. This is not a number that is fixed, either. More and more people are choosing social media as their number one brand outreach tool for customer service because it is simple and quick. Just make sure you have the resources to take care of the increased demand for customers service on social so no messages are left unanswered. Instagram generated close to $3.2 billion in mobile ad revenue in 2016. 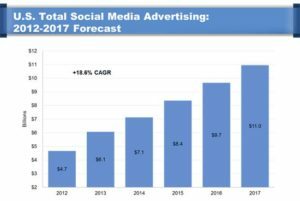 Since Instagram was acquired by Facebook, and eventually started displaying ads, their ad revenue has increased dramatically year after year. If your brand is looking for a new marketing source on social media, Instagram might be for you. After all, it is for millions of brands. In 2017, Instagram brought in close to $5.4 billion in mobile ad revenue worldwide. Who knows where the future will take us, but what we do know that Instagram ad spends by brands isn’t slowing down. Brands are clearly seeing incredible results from it. This is one of the powerful social media statistics that prove brands are realizing how effective social media ads are due to their targeting, allowing you to only reach the people who are relevant to your brand. Social media has and is continuing to revolutionize the way brands are marketing themselves. Social media has given brands a direct channel to their target audience which they can reach, and impact, and ultimately gain marketing benefits from. There are still people who say that social media isn’t for brands, and brands that are critical to social media, but if 88%, it’s difficult to say anything else than that it is beneficial for brands. 75% of marketers use social media to develop loyal fans. Social media is one of the most powerful tools for customer interaction and engagement brands have at their disposal today. By interacting with your audience on a regular basis, and having genuine one on one chats with them, your followers will become more loyal, and their trust to you will increase. In case you didn’t know, trust is the single most important thing to driving a sale. If a person doesn’t trust you, they won’t buy from you. 66% of marketers have set up a team solely dedicated to social media marketing. Social media generates amazing results as you can see from the statistics, but to achieve those results you need to invest resources. Both time and money. Don’t just pick the youngest people on your team and expect them to be able to drive results. Social media demands knowledge and strategy. 93 of marketers use Facebook ads regularly and 65% plan on increasing their Facebook ad spend and activities. Facebook ads are considered to be one of the most cost-effective marketing ways for brands today. Learn how to use Facebook ads properly and you’ll be able to generate an incredible ROI, even with a small budget. 46% of web users look at brands’ social media presence before making a buy. Your social media pages reflect you and your brand, and many people go to them before making a purchase. Make sure you invest plenty of resources into building a strong and powerful social media presence and you’ll be able to convert more people into customers. If you have a social media account that looks like a ghost town with only a few posts and only a few followers, chances are: people will be turned off and run the other way. The punchline is: if you have a weak social presence – it’s going to cost you. 99% of top brands are using Facebook for marketing. If you want to become a top brand, you need to adopt many of their marketing strategies. Because almost 100% of top brands use social media, see it as your duty to start building your presence today if you haven’t already. 82% of B2B marketers use social media marketing to increase brand exposure. Social media is a powerful tool for increasing brand awareness. This applies whether you’re a B2B or B2C company. 83% of B2B marketers use social media marketing to increase website traffic. 83% use social media to increase website traffic – and it works! If you’re looking to increase your website traffic, thinking outside of the box of only using Google ads is essential. Implementing social media into your efforts of increasing your website traffic is an opportunity you simply can’t afford to miss out on. 70% of B2C marketers have acquired customers through Facebook. People laughed if someone said that you can acquire customers through social media 10 years or so ago. But today, no-one is laughing anymore. The reality has caught up with us. It’s logical if you think about it. People are spending more time than ever on social media. It’s where their attention is. If you can be there to meet your audience’s needs and impact them, you can acquire customers from it. 67% of Twitter users are far more likely to buy from brands they follow on Twitter. By interacting with your audience on Twitter, and building up a strong presence there, you’ll be able to acquire more customers. 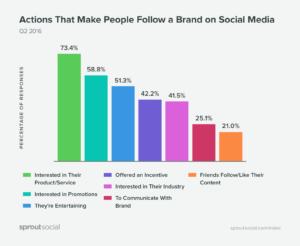 People have a great interest in brands on social media, and the reason they follow brands on social media varies. Succeed in providing what your audience wants from you and you’ll be able to accumulate more followers who are likely to be converted into customers. If 72% of internet users are active on social media, so should you! Of online adults aged 18-34, 95% are most likely to follow a brand social media. If your target audience is within that age group, good for you! If you are able to give them the content they are looking for, you’ll have an easier time accumulating followers. If your target audience isn’t in that age bracket, don’t worry! You can still see tremendous success on social media. Just make sure you have identified your ideal audience, and chosen a few core social platforms where they are most active. 71% of consumers who have a good brand experience on social media are likely to recommend it to others. A good brand experience on social media is mainly focused on the way you interact with your audience, and how quickly you can respond to their messages. Have the resources needed to provide a good brand experience on social, and be available 24/7. 30% of millennials are engaging with brands on social media at least once a month. If your followers engage with you, make sure you engage back. Social media is called social media for a reason. Thank everyone who comments on your posts, respond to every message, and thank people who are sharing your posts in the most genuine way. 7 in 10 of generation Xers will likely buy something from a brand they follow on social media. Get people to follow your brand and you’ll see an increase in sales. Don’t just look at acquiring any followers. Make sure those who actually follow you are within your target audience. If you buy fake followers in the belief that bots will buy from you, you’re absolutely wrong. 32% of generation Xers interact with brands at least once a month. 67% of generation Xers are likely to buy from a brand they follow on social media. 60% of millennials are likely to buy from a brand they follow on social media. 71% of people are more likely to buy from a brand after a positive social media brand experience. Not only will providing a good brand experience to people on social media help you attain word-of-mouth marketing which is one of the most powerful marketing ways. People are also more likely to buy from you if you succeed in giving them a positive brand experience. The average response time for a brand communicating with a social user is 10 hours. 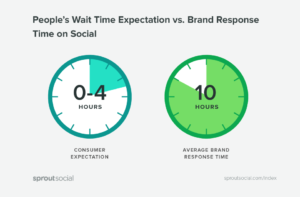 The average response time for brands on social media is 10 hours, but the customer expectation is 4 hours. Put great emphasis on responding to your customers as quickly as possible and they’ll thank you for it. If you can give rapid responses, your retention rate will increase, and your customers will view you as a brand to trust. 50 million small businesses are using Facebook pages. 50 million! If you haven’t yet created a Facebook business page, now is the time. 92% of small businesses believe social media marketing is important to their business. Do you? 92% believe that social media marketing is important for their business, and based on the many statistics we’ve just seen, we can without hesitation say that it is. As more and more marketers realize the many benefits of Instagram ads, and how easy they are to set up, through the Facebook ad manager, Instagram’s ad revenue will only continue rising. 90% of B2B Businesses report seeing an increased exposure as result of social media usage. Social media lets you reach more people, and the increased reach also means an increased exposure. With social media, you can reach thousands of people, even millions! All without paying a single dollar for ads. The days where billboards were essential for exposure are over. 33% of customers prefer to reach out to a company for customer service via social media over any other brand outreach channels. More than one-third of your customers prefer reaching out to you on social media, but what if you aren’t there to meet that demand? Make sure you put great resources into meeting your customers on social media and respond to their messages as quickly as possible. Social media marketing budgets have doubled worldwide in just two years. From $16 billion to $31 billion in 2016. Brands are shifting their marketing budgets and putting more towards social media marketing. 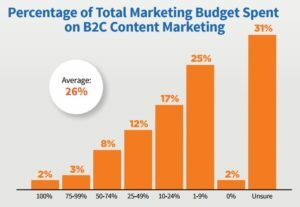 How does your social media marketing budget look? Your competitors are investing more in social media marketing because they can measure amazing results from it. Don’t hold on to expensive display advertising that gives you close to zero ways to measure your results. Society and the places where people’s attention is, change, and so should your marketing stratgy. People in the age of 55-64 are more than 2X more likely to engage with content shared by brands on social media than those aged 28 or younger. People in the older demographics are more likely to engage with your content if it speaks to them. If these are within your target audience, make sure you pinpoint them and start posting content that resonates with them to further increase that number. 44% of businesses working locally say they depend on social media marketing to generate brand awareness. At the same time, 41% say they depend on social to generate revenue. Social media can generate many different results. It can generate everything from sales to brand awareness to website traffic. Just make sure you set clear goals for why you are using social media and you’ll be able to both see when you’ve reached those results and also measure them. This is not very surprising, really, because the fact of the matter is that humans are visual creatures which resonates a lot better with visual content Han we do with text. In fact, humans can process visual content up to 60,000 times faster than text, so therefore, you can expect that people prefer visual content over text -including on social media. This just shows the immense power that Facebook ads hold. And probably the most important reason for this is that Facebook ads offer a tremendously effective targeting system which allows you to only reach the people who truly matter to you, and thus are most likely to convert. Close to 90% of marketers say their social media marketing efforts have led to an increased exposure for their business. The beauty of social media is that it can be completely free if you want it to, but it can also be expensive if you want it to. No matter which of these is your choice, you have the possibility of gaining results from social media, and an ROI that is hard to beat. This is a social media marketing statistic that is providing just how big of an impact social media marketing has on customers. And what’s interesting about this is that it proves that the way you succeed with social media is not by shoving ads down your followers’ throats. Marketers need to start seeing social media as a relationship tool rather than a promotional tool. Because the way you generate real results is by building strong relationships with your customers, which in turn makes them loyal supports of your brand, and returning customers. Among marketers who have implemented social media marketing, more than 50% report increased sales as a result of it. If you’re struggling with sales, or just want to find new channels to grow your sales with, social media is a wonderful tool. No, it’s not just for teenagers posting selfies. It’s also for brands like Gucci and Louis Vuitton, as well as brands like Ford and H&M. No matter what type of brand you are, chances are you’ll be able to reach your target audience and get great results from it. The popularity of video content is increasing. And that isn’t really surprising considering the fact that we humans are visual creatures that resonate well with visual content. As a marketer, you want to give your audience what they want, and right now, people want video content. So are you just going to sit there? Since humans process visual content a lot better than text, video content also makes it easier to impact your audience and get them to do what you want – whether it be to buy from you or sign up to your newsletter. This is one of the social media statistics that give you a hint of what you should be doing in your social media efforts. By looking at what the crowds are saying and thinking, you can optimie your strategy to better suit their needs – before all of your competitors realize what they should be doing. Continuing on the last statistic, it is quite clear that video content is increasing in popularity, and if you don’t have a strategy for how you’re going to create and share video content on social media, you’re missing out. A prime example of something that people consider irritating on social media is ads. Remember that people aren’t on social media to have ads shoved down their throats, and this social media statistic proves this. People are on social media to have a good time, interact with their friends, and hopefully learn something new on the way. All of these things are things that provide value. While social media is a tremendous tool for marketing, the only way to market your brand isn’t to shove ads in your followers’ face. Instead, you can generate incredible results by leveraging social media as a relationship tool that you use to improve your customer relationship and increase customer loyalty. If you are, however, going to share promotional posts, the 80/20 rule is often spoken about, where you post 20% promotional content and 80% content that brings your audience value. There’s a misconception that it isn’t possible to measure the ROI of social media, but that is just not the case. However, this social media statistics show that many marketers seem to believe that is true. But the reality is that the ROI of social media marketing can be measured. It’s just that you need to know how you do it. Because when you know what you should measure, and how you measure it, measuring social media ROI is actually not that much harder than other marketing sources. For instance, tell me how to measure the ROI of a TV commercial. Compared to Facebook Ads, for instance, there is no way to know who saw your ad, how they engaged with it, and so on. Some marketers are holding onto the past without thinking about what it really meant because measuring the ROI of social media isn’t more difficult than measuring the ROI of other marketing efforts. It’s just about knowing how you measure it. Don’t be overromantic of what used to be, embrace what is now. Not only does this show that the market is changing, and that the way people (in this case from the younger generation), but it also shows that they are influenced not by traditional banner ads, TV ads, or radio ads, but instead, they are influenced by ads that appear at the place where their attention actually is: social media. Many of the social media statistics presented above show the immense potential and power that lies in social media marketing, yet still, marketers seem to have a hard time measuring its effectiveness. There’s a misconception that it isn’t possible to measure the ROI of social media, but that just isn’t true. In fact, measuring the ROI of social media marketing is not necessarily more difficult to measure than any other marketing efforts. it’s just about knowing how to do it. And if you are a marketer who is struggling with this, you’ll find the complete guide to measuring the ROI of social media helpful. The statistic above showed that nearly half of all marketers struggle with measuring the ROI of their social media marketing. But here, we can see that 15% of marketers actually can measure the ROI of their social media marketing efforts. This just goes to show that while some people are critical to it not being possible to measure the ROI of social media, it is most definitely possible to do so. This further proves the issue and frustration many marketers seen to be feeling with social media and ROI. While many brands both generate amazing results from social media, and have an easy time proving their results, many seem to struggle with being able to prove it. Despite this, many CEOs are negative to social media marketing and that their brand should be using it. This is, of course, a bit counter-intuitive as the evidence that social media marketing actually works is right in the mirror: themselves. Moreover, only 27% of top companies said their C-level executives were actively engaged in social media. While some top bosses and brands are negative to social media, most brands realize the importance of social media marketing and being where the audience is spending its time. As a result, we’ll be seeing marketing spend on social media increase within the next years. And at the same time, advertising spend on traditional marketing sources such as display ads, tv ads and radio ads will continue to decrease. This is quite an interesting social media marketing statistic because it proves that brands see social media marketing as a challenge. The truth is that social media marketing has a tremendous potential to help brands drive great marketing results, as mentioned many times before, however, the catch is that you will only do so if you have a great strategy in place. This is why many marketers take help from outside agencies because they don’t know how they are going to leverage social media for great marketing result. Among social media marketing statistics, this gives you a hint of what social media can do for brands. Sure, social media has proven to be able to drive sales, and much more, but something that it has shown to be very effective at is increasing brand awareness and making people aware of brands’ existence. This is why one of your social media goals should probably be to increase brand awareness. Because this is one of the social media statistics that prove many others brands have their goal set to increasing brand awareness. This is actually not that surprising because the thing is that social media marketing doesn’t have to cost anything else than your time, unless you want it to, and normally, as a startup, you don’t have a lot of money, so, therefore, they want to leverage every free marketing channel they can. Customer retention is increased by building and improving your customer relationships. And the reason for that is that relationships increase trust, and trust leads to customer retention. And social what many marketers have got all wrong about social media is that it isn’t a promotional tool, but instead, it is a relationship tool. It’s called social media for a reason, remember? With the fact that social media is a relationship tool, not a promotional tool, in mind, these brands are missing out on incredible opportunities to improve their customer relationships, all because they don’t realize how great of a relationship tool social media really is. The social media trend is going in the right direction, because more and more brands are slowly realizing that social media has more benefits than you can close your eyes from and pretend you don’t see. In other words, brands can’t afford to ignore social media. These statistics clearly prove that the social media revolution has begun. Social media has gone from being a luxury of only a few brands to becoming something that is vital for almost any brand. There’s no doubt that social media is a powerful tool that has the potential of generating amazing results for your business, but in order to reach those results, you need to invest time, and resources towards mastering social media and building your presence. Today, over 2.8 billion people are using social media, so chances are you’ll be able to find your target audience there. To achieve marketing results worthwhile on social media, you not only need to have the proper resources, you need to have a strong and clear social media strategy as well as a content strategy. Are you impressed by these statistics?